What Happens to an Insolvent Estate in Florida? Suppose you had a wealthy relative who named you as a beneficiary in his last will and testament. You would probably assume this guarantees you a substantial inheritance when the relative dies. But sometimes outward appearances of wealth are deceiving. In fact, when that relative does pass away, you might be surprised to learn his estate was actually insolvent and your “inheritance” amounts to nothing. When a person dies, after all, they leave more than their assets. They also leave debts. These don’t simply disappear. Your hypothetical relative’s creditors have the right to file a claim against his estate for the money they are owed. 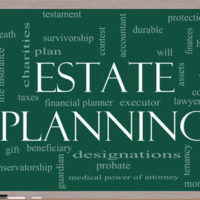 In addition, there are various expenses associated with the administration of the estate itself that takes priority over making distributions to heirs and beneficiaries. It is therefore possible for an estate with substantial property to be insolvent–i.e., where the debts exceed the assets. For all practical purposes, an insolvent estate is the equivalent of a living person forced to file for bankruptcy. Except in this case, it is a Florida probate court (rather than a federal bankruptcy judge) who oversees the final distribution of the estate. Florida law establishes a priority list for paying any creditor claims. In other words, some creditors get to go the front of the line when there is not enough money in the estate to pay everyone. The highest priority goes to the costs and expenses of administering the estate itself, including the payment of any legal fees. The next highest class includes funeral and interment expenses (up to $6,000). This is followed by tax and legal debts, the deceased individual’s final medical expenses, a family allowance (up to $18,000), any unpaid court-ordered child support, debts acquired by the business of the deceased after his or her death, and finally “all other claims,” including any unsecured debts. Note that within a given class of debt, the law does not prioritize any particular creditor. So let’s say your deceased relative had $100,000 in assets and $200,000 in credit card debts split between 5 different cards. After paying any administrative expenses and higher-priority debts, the executor of the estate would divide what is left from the $100,000 and pay each of the 5 credit card companies in proportion to the total amount of debt owed. Of course, this leaves nothing for you as the beneficiary. Keep in mind, however, that some creditors may not file a claim against the estate. Other creditors may be willing to negotiate a settlement for less than the full amount of the debt. This is why it is critical for the executor or personal representative to work with an experienced Fort Myers estate and probate administration lawyer. Contact the Kuhn Law Firm, P.A., at 239-333-4529 to schedule a free confidential consultation with a member of our legal team regarding any probate or estate planning matter.